In this compelling and lucid account based on years of research and first-hand experience, rooted in on-the-ground reporting, interviews, observations, analysis of data and a viewpoint that sees China from the inside out, Jonathan Fenbylinks together the myriad features of today’s China. Fenby manages to avoid the binary approach so often applied to China – the country is either good or bad, set to reach the stars or collapse in chaos – finds Ting Xu. Tiger Head, Snake Tails: China Today, How it Got There And Where It Is Heading. Jonathan Fenby. Simon & Schuster. February 2012. Jonathan Fenby is an eminent author, journalist, and editor. He was Editor of the Observer and the South China Morning Post. He currently heads the team for the research service Trusted Sources in London. He has authored eleven books, many among which are about China’s history, politics and political economy. Fenby’s most recent book draws on his intensive first-hand experience in China as editor of the South China Morning Post and his most recent research work as head of the China team at Trusted Sources in London. It offers a comprehensive and balanced account of China’s past, present, and future from the viewpoint of a journalist. It has successfully integrated a wide range of political, economic, social, cultural, demographic issues into a 400-page analysis of the ‘uniqueness’ of China. The book has been written primarily for people who may not have much knowledge about China so that they may grasp ‘where the fastest-growing major nation stands and what that will mean both for China and the world in which it looms so large’. 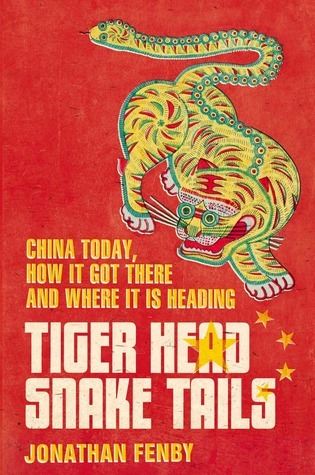 The title of the book, Tiger Head, Snake Tails (hutou shewei) is eye-catching and is an adaptation of a Chinese phrase selected to “suggest that one has to take into account not just the China that hits the headlines, or the top-line economic statistics or the straight-line projections to a future that may or not come to pass, but also a host of down-to-earth factors which actually determine how the country functions and where it is going”. Fenby has certainly looked below the surface of China’s success that obsesses many optimistic observers – its high growth rate (which relies heavily on a property-driven economy), heavy global investment, the luxurious lifestyle of the elites, the expanding consumer society and so on. Instead he stresses the price paid and deep problems embedded in such success such as the huge urban-rural divide, the lack of trust, social unrest, environmental degradation, governmental problems and many other issues. China is transforming at an extremely fast pace. Yet, we can also see that in many areas little seems to have changed. Current debates on where modern China stands and where it is going can be grouped under three headings. The first is liberalism or neo-liberalism that regards free markets, individual liberty and private property rights protected by ‘the rule of law’ as the sine qua non for sustained economic growth. The second is the so-called ‘new left’ who cherish some ill-defined new collectivism and warn against the dangers of diminished state-ownership and encroachments upon social equality. The third tendency is the rise of a so-called ‘post-neo-Confucianism’ that cherishes the past and recommends a synthesis of socialism and Confucianism. Albeit coming from different positions, these three themes share a common assumption that the transformation of China is an evolutionary and linear process: the past has been packaged into ‘feudalism’, the present into ‘socialism’ (with Chinese characteristics), and the future perhaps into ‘capitalism’ (again with Chinese characteristics?). Fenby’s analysis does not fall into such an over-simplified portrait of China. He has grasped the complexity and many contradictions that China exhibits: continuity vs. discontinuity, diversity vs. uniformity, Marx vs. market, urban vs. rural, public vs. private, local vs. global. For example, although discontinuities seem to be obvious in Chinese history, continuities are often ignored. In fact there was as much continuity as discontinuity in Chinese history. Both have been embodied in the governmental ideologies and political institutions of the Republican (1911-1949), of Mao (1949-1976) and post-Mao China (1978-present). China will never escape from its past. History has always been inextricably linked to the governmental issues: How to govern such a country with its huge territory, large population, and enormous diversities? A Confucian way of rulership can be represented as rule by elites who cultivated the way of ‘being an inner sage so as to rule the outside world’ (neisheng waiwang). Rulers were expected to provide good examples to be imitated by ordinary members of society. The same of pattern was followed under Mao and has continued in post-Mao China. China is not so much governed by law from above. State law is not the most important mechanism to govern the society. Together with discipline, education, local customs and practices enforce moral values through concepts such as guanxi (the rule of relationships and networks) and renqing (affection). Trust exists in close personal relations but not in the social systems. Fenby’s analysis implies that economic, legal and political reforms have been shaped mainly from the top down – created and used by elite communities of bureaucrats, politicians and legal professionals – for the purposes of revolutionary change and modernization. Yet these reforms have unintended consequences. They have unleashed private, informal power which breaks through the old system, disobeys the law or does not conform to policy. It lingers in a grey area between ‘the legal’ and ‘the illegal’. Moreover, under China’s ‘quasi-federal’ structure of government, whether an informal institution is successful or is legalised is largely due to the attitudes of local governments, which can play roles in either facilitating or obstructing its emergence. Perhaps Fenby could have given more emphasis to these grassroots communities, as they are the real ‘down-to-earth’ factors that will determine the future of China. My review should end here with a brief summary of the implications of this book, borrowing the original meaning of the phrase ‘Tiger Head, Snake Tails’, which means a strong start with a poor finish. Fenby’s book has shown us that the prediction of China’s future is not going to follow the binary trajectories – either it will rule the world or it will collapse. But whether it will end up with ‘snake tails’ really depends on whether it can resolve internal complexities of governance and problems from below, and, more importantly, find and follow a sustainable way of development, in which the care for people outweighs a concern for statistical success. Dr Ting Xu is Research Fellow in the Economic History Department at the London School of Economics. Her research interests include law, governance, development and socio-economic transformation in China. Read more reviews by Ting Xu.